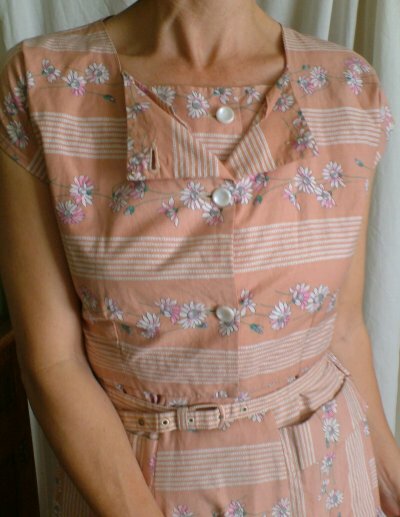 Vintage 1950s pinky print dress with bolero. Here is a cotton dress which will take you anywhere - simply add the bolero jacket for instant 'smart'! The dress has a square neckline - back and front - two practical pockets, a self buckle belt, is sleeveless and has lots of little gathers at the hips. It fastens with a side zip and front buttons. The bolero has cap sleeves and fastens with three buttons. The fabric has a base colour which is hard to describe; a sort of creamy toffee shade. 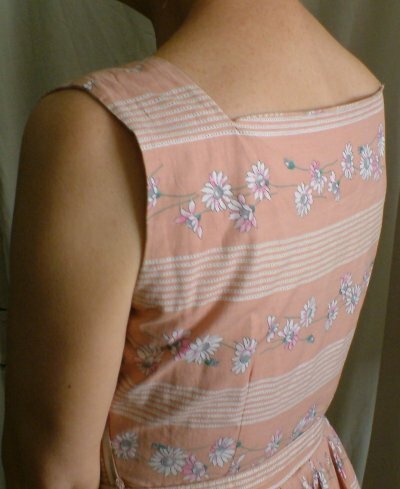 The pattern is pink-tipped white daisies and narrow white stripes. It is in generally good condition: there is a small, mended tear by the zip, but otherwise I have found nothing. It's a smallish size - probably about a UK 8 - 10. Approximate measurements are: bust 35 ins/89 cms, waist 26 ins/66 cms, hips free, length from back of neck 41 ins/104 cms.